after the first earthquake on nov. 29th at 10h28 we got another one on 30th at 14h56. it was 6 minutes long in Fort de France and destroyed some buildings. but now we receive a news from autorized sources saying the army is on red alert after receiving informations about the probabililty to have another big one in next days or weeks. 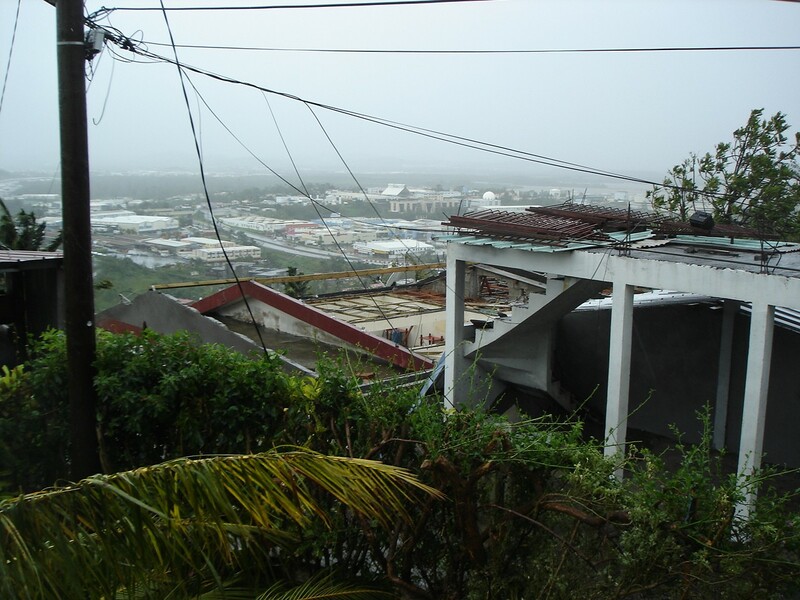 People had been awoken by aftershocks at about 1:00 AM (during the night) in MARTINIQUE. More news later about it. A british tourist died in TROIS-ILETS (south-west of MARTINIQUE) because of heart attack following the earthquake. Six persons were injured while trying to flee through windows. About 100 persons felt sickness. Un premier bilan fait état d'un mort, un Britannique qui a été victime d'un malaise cardiaque aux Trois-Ilets (Martinique). On signale aussi un nombre pour l'instant limité de blessés. Christian Estrosi, le ministre de l'Outre-mer, a fait savoir que des hélicoptères de la gendarmerie effectuaient des repérages à la recherche d'éventuelles victimes à la Martinique, et a cité le cas de "six blessés par défénestration". Il a aussi fait état d'"une centaine de malaises" à la Martinique. This afternoon, Nobody in Martinique can tell that he did not feel this one ! It was a Big One! about 1 minute non stop! I was under a hagar in Le Lamentin International Airport, working on a plane when suddenly, I saw everything dancing around me. I was dancing too! all the light aircrafts were dancing in the area... Rapidly, I understood that this one would be a big eathquake...nearly 1 minute. About 5 minutes after the end of the swing, the firemen arrived to inspect all the area. On the runway far away, I was able to ear the horns of other firemen, ambulances and police. I intented to phone to my wife, but impossible. The communications were unserviceable. I went rapidly to my car listening the radio. 7.3 on the Richter scale. Some old buildings broken in Fort de France, but not a lot. In the rest of the Island, it seems to be ok. We will know more tomorow. For now, a lot of shocked persons but no dead people. It is the more important thing! Tomorrow no school. General inspection of the classrooms. Today afternoon will stay in our memories for a long time! We know that a Big One was awaited. Was it him ? I've just watched TV MARTINIQUE. Damages are important but global situation is not critical. 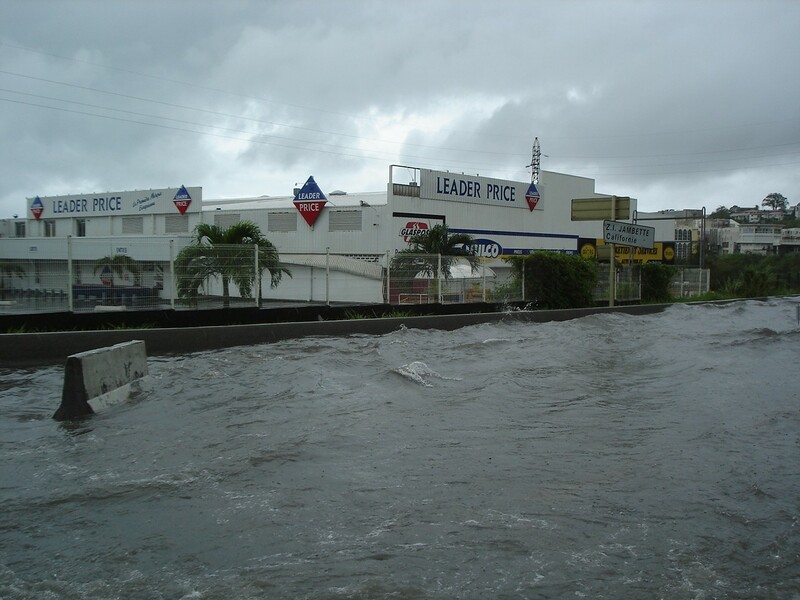 Capital FORT-DE-FRANCE is in state shock because of debris on the roads. Most important street (Rue SCHOELCHER) has been closed by authorities in order to ease cleaning operations. North of island has been most affected. A unhabitant has been very injured while trying to escape through windows in LORRAIN (North-Atlantic coast). TRINTE's hospital has been closed because of severe damages. Schools will be closed tomorrow in order to monitor concrete structures. In Guadeloupe there were a lot of sikness. Some people have been hospitalized. Schools will be closed tomorrow. Catch up on fall's hot new shows on Yahoo! TV. Watch previews, get listings, and more! - No rest for us!!!! Today it was a rainy day with some wind, now sky is a little overcasted, maybe more rain at night, we were having a really hot weather during the week that I get used to it!!! it will bring plenty of rain specially to the south but nobody knows where it will be passing by. I'm going to write down, explain and answer everybody tomorrow, thank you very much for all your messages, I only can say I had a lot of chance in the other hand, now I had the experience also!! French Prime Minister FRANCOIS FILLON will be in MARTINIQUE - and GUADELOUPE- Wednesday and Thursday. he will visit south of island -Partciculary RIVIERE-PILOTE- devastated by hurricane DEAN. This is an automatic translation of local authorities from french language to english language. So perhaps the translation is not perfect. But it remains understable. 75 000 euros of funds were released in favour of the disaster victims -the most deprived inhabitants -of Martinique, one learned Monday evening at the end of a meeting of a committee of attribution of the helps of extreme urgency in Extremely-of-France (Martinique). The whole of the mayors of the island, the representatives of the local authorities and the actors economic took part in this meeting chaired by the prefect of Area. "It is a help simply of first urgency on which a first appropriation was released and which is not restrictive", the prefect of Area Mancini Angel indicated, at the time of a point of press. "It is what is called of the appropriations évaluatifs and it will be according to the needs", it still added. This first urgency is given "to make it possible all those which, in the 24 or 48 hours, have needs, to be able to accompany them on small problems, the purchase of a cover, the purchase of the books for the school re-entry, milk or food, with those which are completely stripped," continued the Mancini prefect. According to him, this help is not in any way a compensation. This one will be organized thereafter by aid funds which will come after an evaluation carried out by the communes. During the meeting of the committee of attribution, the decision agreed, on this funds, 300 euros per hearth whose houses were destroyed or which the habitability is not today assured any more and to add with this sum, 80 euros per dependent children. According to the prefecture, all will be done so that these assistances of extreme urgency can arrive near the populations in the five days following their request ". Lastly, the prefecture of the Martinique Area announced the opening of a bank account for all those which wish to express their solidarity with the disaster victims touched by the Dean hurricane. They will be able to do it by order check of: "Governed Hurricane Dean Martinique" Addressed To "General Treasury, Governed Dean Hurricane, LP. 654/655 - 97263 Cedex Extremely-of-France. Or by transfer on the account: code banks: 10071; code counter: 97200, n° of account: 00001000431; key: 49. - It is time to work !! Now Public Services ask workers to go to office. RFO MARTINIQUE announced a third victim. To be confirmed. But 40 % of population of MARTINIQUE are without power. But 60 % of population of MARTINIQUE are without power. I am listenning RFO MARTINIQUE. People are concerned about water supply. They also criticize a lot of sad behaviours from few citizens. For example one listener saw a woman buying twelve breads !! Perhaps too much in disaster era !!! 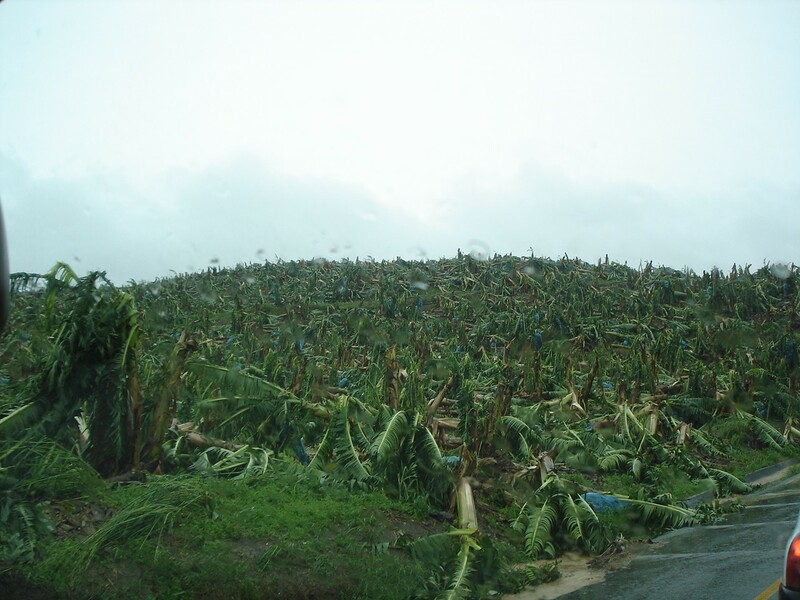 -100% of bananas trees destroyed. Financial assessment is about  ? 200 millions. because of fallen trees and floodings. which are capable to made bread are "invaded" !!!! See photos of nearby of FORT-DE-FRANCE and LAMENTIN in MARTINIQUE. martinique. But i have lot of connections with people on place. (10m) destroy a large part of the fleet of siling boats in le marin. some slides sent by a friend. also for specialists to re connect power. 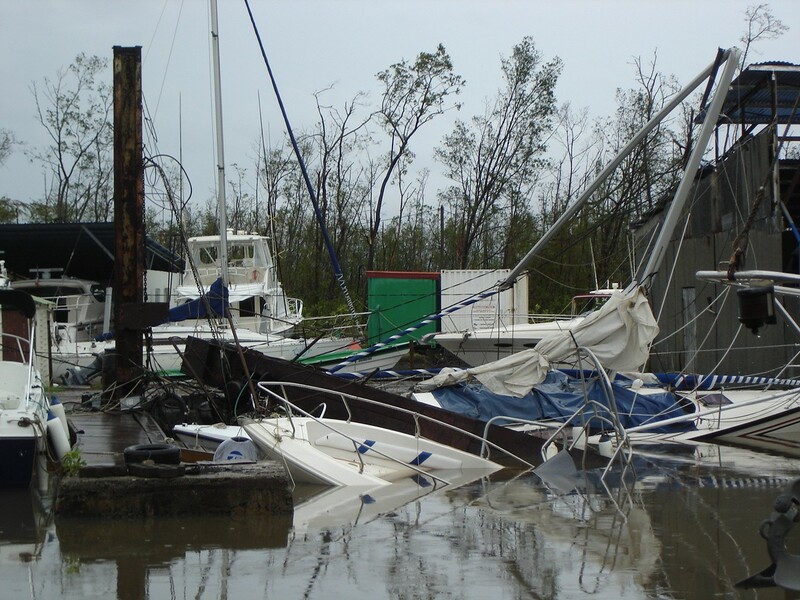 boats sinked at port coé, near the airport. power, but many places without drinking water. - Relax ... take it easy!!!! Good song isn't it? ... that is what is passing on in the radio now, I think in order to calm everybody since the worst is going to be for us !!! I don't know why but I'm still thinking it's going to pass earlier than forecasted ..
is that mean is going to be stronger? Some rain and gusty winds for moments a lot of breeze here, it feels so fresh... of course they say it is a little tropical wave ... but Is that mean also something good for us?.. Each 15 minutes news of Dean's development is passing on the radio. It seems that Dean will pass rapidly, that's is good, but someone has told this before, that leave us not so much time to prepare, since there are some people that still doesn't know that it was declare an hurricane today early in the morning.. It doesn't seem for Dean to decide where to go, north or south... Dean is driving me crazy!!! "... DEAN IS A RELATIVELY SMALL TROPICAL CYCLONE ... "
Should this comment was made to relax anyone? ..
Everybody in southern islands are worried about, as here, with Dean, and yesterday in my last message I didn't mean to be insensitive about the southern islands at all, I only wanted to make the point of what happenned with Ivan, and its incredible and unexpected southern path for the almost last moment.. in 2004.. for a reminder he was supposed to hit us!!! But now, It doesn't seems to me that we are in the same case, it has been a lot of time since our last hurricane's hit ... apparently .. and it's going to be my first hurricane's experience..
always stay connected to friends. - Rain is coming back!!! Vacances were too short this year, we are beggining too soon, it makes me remember 2005, but even then, season began in June, now it's already may that we are talking, Andrea wanted to be the very first one this year!! Hoping this won't be a so dangerous year! !